Hudson’s Bay’s popular “Bay Days” sale is back! Shop thousands of items at their lowest prices of the season and save up to 50% off sitewide! I browsed around TheBay.com and there’s over 43,000+ items on sale! The sale is available in-stores and online for a limited time. The Bay normally offers free shipping on orders over $99, or $45 with a HBC credit card. They offer free easy returns. Click here to shop Hudson’s Bay online now or more details. 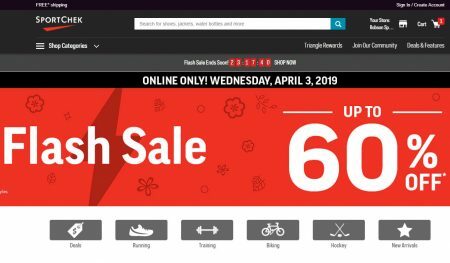 SportChek.ca is having a 1-day only Flash Sale. Save up to 60% off select brands & styles + free shipping on your entire order! Hurry, the sale is available online-only on Wednesday, April 3, 2019 or while supplies last. Shop early for the best selection of sizes and styles. Sport Chek is offering Free Shipping on all orders during this sale. Click here to shop Sport Chek online now or for more details about the sale. 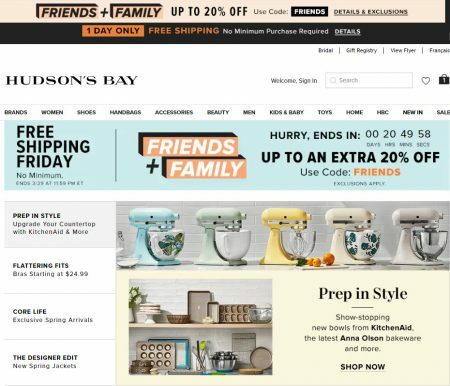 Hudson’s Bay is having 2 offers today Free Shipping Friday + Friends & Family Sale. Today only (March 29, 2019), enjoy Free Shipping Friday (Free Shipping on All Orders – No Minimum). Plus, combine the Free Shipping Friday offer with their Friend’s + Family Sale. Extra 20% off sitewide when you use your Hudson’s Bay Mastercard or Hudson’s Bay Credit Card. Extra 10% off Confectionery & Gourmet, Furniture, Major Appliances, Mattresses & Mattress Adjustable Bases, Patio Furniture, Personal-Care Electrics, Toys, Strollers, Car Seats & Travel, Baby Toys & Activities, Baby Feeding, Baby Health & Safety, and Baby Bath, Potty & Diapering, No Matter How You Pay ( with any tender). The sale is available in-stores and online at TheBay.com for 5-days only from Wednesday, March 27th to Sunday, March 31, 2019 at 11:59pm ET. Click here to shop TheBay.com now or for more details about the sale. Lululemon apparel rarely goes on sale. If you’re looking for a lululemon sale, your best bet is to check out their “We Made Too Much” clearance sale page. Men’s page currently has 110 different items. Great products in sizes and colours we made too much of. View our size chart for more information on how our products fit, or find out more about our fabrics and how to wash them. Full of gear we won’t see again for a while, this is our last chance at some great technical wear – we include shipping but all sales are final. I browsed around and there’s some pretty good deals. This sale is available online only. All sale items are Final Sale – no returns or exchanges. lululemon.com offers Free Shipping on all orders shipped to Canada and the US. Click here to shop lululemon Women’s “We Made Too Much” clearance page. Click here to visit lululemon Men’s “We Made Too Much” clearance page. 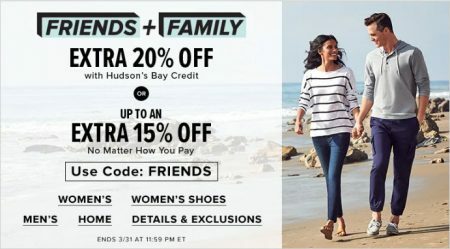 Hudson’s Bay is having a Friends & Family Sale. Save up to an extra 20% off sitewide!